Unlike Hyperbaric Oxygen Therapy (HBOT) that employs a chamber with a pressure higher than 1 atmosphere absolute, negative pressure wound therapy (NPWT) uses a vacuum to enhance and promote wound healing in acute, chronic and burn wounds. In this medical procedure, a sealed wound dressing is attached to a pump that creates a negative pressure environment for the wound. The vacuum helps to increase blood flow to the area and draw out excess fluid from the wound and depending on the type of wound type or location, it can either be applied continuously or intermittently. This type of therapy can be implemented for a few days to several months at a time. 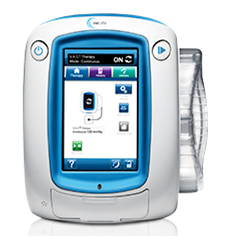 Used in its V.A.C.ULTA™ Therapy System and other wound care products, Acelity’s SENSAT.R.A.C.™ Technology is a real-time pressure feedback system that adjusts its pump’s output, compensating for wound distance, wound position, exudate characteristics and patient movement. Source: Acelity. The applied negative pressure in NPWT can range from -125 to -75 mmHg (-2.4 to -1.5 psi) depending on the type of wound and the patient’s tolerance. For this application, All Sensor’s DLV-005D with its digital output would be an easy way to measure the vacuum level for both the machine’s use and the health care provider’s and patient’s observation. When time is of the essence, add pressure to your cooking. This can allow you to prepare foods up to 70% percent faster than conventional cooking methods and it is applicable to cooking a wide range of foods. An electric pressure cooker (EPC) greatly simplifies the process. After selecting the high or low pressure setting on the control panel, you just press the high or low button for increasing or decreasing the cooking time and then press Start. While simple, an electric unit can take almost three times longer to reach pressure than a stovetop model. A North America pressure cooker operates at a nominal pressure of 15 psi (103 kPa) (high pressure) or less (typically 6-8 psi for the low pressure setting). The positive feedback system in one company’s EPC allows it to achieve precise cooking conditions. 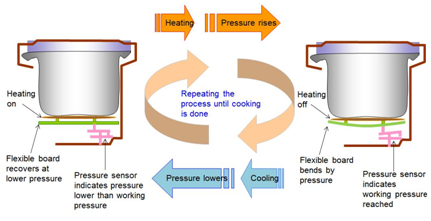 In addition to pressure sensing and other elements, a microprocessor controls the timing, heating and complex cooking cycles. The pressure sensor indicates lower than working pressure or when the working pressure is reached. Instant Pot’s electric pressure cooker contains a heating element, pressure and temperature sensors and a control box. Source: Instant Pot.